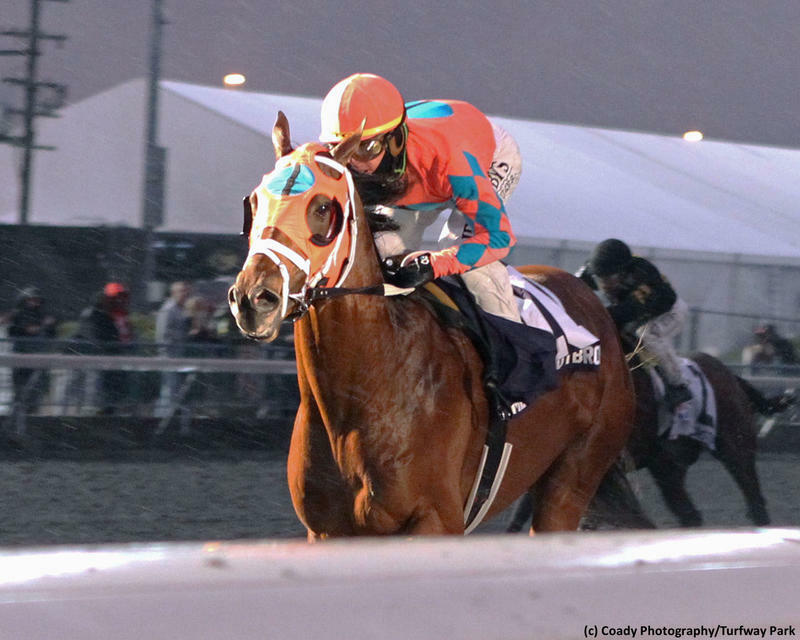 Skychai Racing, LLC and Sand Dollar Stables' Somelikeithotbrown took the lead soon after the break and never looked back en route to a decisive 3 1/4-length tally in the Jeff Ruby Steaks (G3) at Turfway Park on Saturday. The three-year-old earned 20 points on the Road to the Kentucky Derby for his work. Somelikeithotbrown debuted at Saratoga in July and was unplaced in a sprint over a sloppy surface going 5 1/2 furlongs. The bay came back a little more than two weeks later going long on the turf and he romped, earning a convincing eight-length win for conditioner Mike Maker. Stepping up to graded stakes foes in his subsequent outing, the New York-bred colt tracked the early pace and stayed on to be a sharp second in the With Anticipation (G3). The son of Big Brown finished in the same spot in the Pilgrim (G3) next out after holding an edge through most of the stretch. Somelikeithotbrown was given a 15-1 chance in the Breeders' Cup Juvenile Turf (G1) at Churchill Downs in his season finale. Breaking best beneath Jose Ortiz, the speedy colt nearly pulled off a front-running heist when eventually finishing a close third, proving his class with the top grass runners from here and overseas. He prepped for the Jeff Ruby with a facile score in the John Battaglia Memorial, which marked his debut on an all-weather surface. The versatile bay now sports a 7-3-2-1, $363,478 lifetime line. The son of 2008 Kentucky Derby (G1) and Preakness (G1) star Big Brown is out of the Tapit mare Marilyn Monroan. He hails from the same female family as champions Stevie Wonderboy and Big Blue Kitten. Somelikeithotbrown has a lot going for him and I consider him to be a sleeper this spring. The sophomore is obviously full of talent, and he has proven to be capable of running from both on the lead or rallying from off the pace. Two major questions surround his chances at being a Triple Crown contender, though. First, can the colt run with the best in his division on the dirt? His lone race on the main oval was a toss to me, coming in the slop in a sprint on debut. He deserves another chance. Secondly, can Somelikeithotbrown sustain his run at classic distances? The colt has been drifting out in his races of late, which is a concern, though it could be more of him losing focus when getting to the front. Jockey Tyler Gaffalione indicated that might just be the case. "Down the lane, he was kind of waiting on horses, kind of looking around, but he did everything easy," said his talented pilot. "He's a very nice horse, very talented. He was all by himself and every time I showed him the whip, he'd go one way. He was just acting bored." Somelikeithotbrown is a Kentucky Derby longshot at this juncture. However, if he passes his dirt test next time (possibly, the $1 million Blue Grass [G1] on April 6), a longer look will be warranted at the accomplished colt.